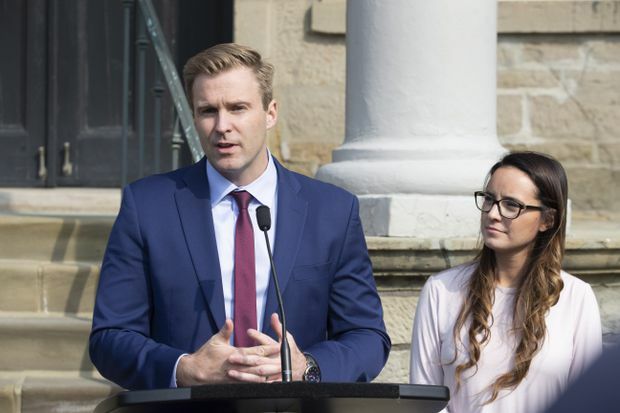 New Brunswick Liberal Leader Brian Gallant and wife Karine Lavoie, right, addresses the media after meeting with Lieutenant Governor of New Brunswick Jocelyne Roy-Vienneau, in Fredericton, Sept. 25, 2018. The day after New Brunswick elected its first minority government in nearly a century, both the Liberal and Progressive Conservative party leaders are claiming the premier’s chair. The Liberals won 21 seats and the Progressive Conservatives took 22, while two other parties won three seats each. With 25 votes required for a majority in the N.B. legislature, the balance of power is held by the Green Party and the People’s Alliance, a populist party formed in 2010 that attracted controversy during the campaign for its language platform, which included eliminating the bilingual province’s official language commissioner. Whatever form that takes will be healthy for New Brunswick’s democracy, said Donald Wright, a professor of political science at the University of New Brunswick. Mr. Gallant, who entered the election seeking to become the first premier to win a second term since 2003, said New Brunswickers sent a strong message about working collaboratively that he “humbly” accepts. He began his day meeting with Lieutenant-Governor Jocelyne Roy Vienneau, who asked Mr. Gallant if he believes he has the confidence of the House, which Mr. Gallant said he intends to recall “shortly,” before the year’s end. Philippe Lagassé, an associate professor at the Norman Paterson School of International Affairs at Ottawa’s Carleton University, confirmed the election did not automatically change Mr. Gallant’s status as Premier. “That’s the key piece of this puzzle,” Mr. Lagassé said. While the Crown can dismiss a Premier, “it will only do so in the most extreme cases,” Mr. Lagassé said, adding that it is convention for a Premier to resign after a vote of non-confidence in the legislature. Mr. Gallant said he has “left the door open to have conversations” with the Green Party but offered no further detail. People’s Alliance leader Kris Austin declined an interview with The Globe and Mail on Tuesday. The province’s chief electoral officer, Kim Poffenroth, told The Globe that there are at least two electoral districts that may see recounts. Those with a difference of 25 votes or less between the first- and second-place candidates are eligible. But recounts, she said, are not automatically triggered as some parties have suggested. Ms. Poffenroth said a judicial application must be made. “At this time, there is no recount process under way,” she said.